Why is Donor Sperm Used? There are a number of reasons why donor sperm is used. In some couples, the male partner is sterile and therefore unable to provide a sperm sample for use in intrauterine insemination (IUI) or in vitro fertilization (IVF). When the male partner carries a serious genetic disease or disorder, a couple may decide to use donor sperm to avoid passing the genetic trait to their children. Finally, single women and lesbian couples who want children can use donor sperm to help them achieve the family they desire. Donor sperm can be obtained from either an anonymous sperm donor or a directed donor. Anonymous donor sperm can be purchased from a sperm bank, whereas directed donor sperm can be donated by a friend or family member. Regardless of which method you decide upon, we strongly recommend you consult with a licensed psychologist or social work counselor to discuss any questions or concerns you have regarding the process. Raising a child conceived through the use of donor gametes (eggs or sperm) has some unique challenges, and it is important you have a chance to consider these unique features and deal with any concerns or questions prior to proceeding with any fertility treatment. If you wish to use an anonymous donor, then you must purchase the sperm from one of the FDA registered sperm banks. The sperm will be sent to our clinic already tested for infectious and genetic diseases. The sperm is usually already prepared for insemination. 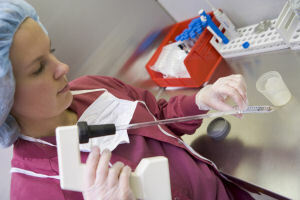 Known donors are screened and tested in our clinic at the time of their donation for numerous infectious and genetic diseases including HIV, syphilis, gonorrhea, chlamydia, hepatitis B, and hepatitis C. FDA regulations require any directed sperm donor to be screened and tested within 7 days of the scheduled date for IVF or IUI. To improve convenience for the patient and the donor, screening and sample collection can occur ahead of time followed by cryopreservation. Donor sperm can be used with IVF or IUI. If you are using a sperm donor with your IVF procedure, you will still administer fertility medications to prepare your eggs for retrieval. Once retrieved, your eggs will be combined with the donor sperm and the resulting embryos will be transferred back to your uterus for implantation. For women undergoing IUI, the sperm is inserted directly into her uterus around the time of ovulation to enhance fertilization of the egg. The American Society for Reproductive Medicine, A.S.R.M., recommends a minimum infertility evaluation on the female prior to donor sperm insemination. This basic infertility evaluation includes a hystero-salpingogram, HSG, to check for tubal patency and normalcy of uterine cavity. For women over 35, some form of evaluation of ovarian reserve is recommended. In women where the ovarian reserve is deemed decreased, more aggressive use of fertility medication to super ovulate may be warranted. Similar to IUI with a partner’s sperm, success with donor sperm insemination is dependent on both the sperm quality as well as the fertility status of the female partner. Women under the age of 35 with no history of fertility problems have the best chance of becoming pregnant with donor sperm. For women over the age of 35, mild to moderate super ovulation with fertility medication is often used to enhance her probability to conceive. Building Your Family Through Egg and Sperm Donation: What You Will Need to Know About the Emotional Aspects, Bonding and Disclosure Issues.